It doesn't matter if you are manning a desk on the corporate floor or answering phones at reception, anyone who works at The Coffee Bean & Tea Leaf must learn how to make coffee. The reasoning behind the strategy is simple: People need to know their cup of java because they are the firm's greatest resource. Or as general manager Alvin Goo puts it: "No staff, no company." Mr Goo, who knows his beans as well as anyone in the chain's cafes, adds: "We believe in the 'workplace experience'. For example, when we hire a receptionist, they go through the basics and learn how to operate the (coffee) machine. "It's not about the level of competence but feeling and knowing how the drink is produced." Employees are also attached to a cafe for a two-day programme, so departments get exposed to outlet operations. The focus on people and getting them to be really involved in the business is all part of what is called the People Developer journey. People Developer is the certification denoting that a firm has attained excellence in developing staff. The Coffee Bean & Tea Leaf achieved the level in 2004 and has retained it since. Business Excellence initiatives like these help organisations gauge where they are in terms of performance and what they need to do to improve. Through it, The Coffee Bean & Tea Leaf has implemented various things such as a structured training programme, skills qualification framework, organisational succession planning and employee appreciation, among others. Besides putting employees through the initial coffee grind, the company has a "very structured career development pathway" for them, says Mr Goo, and 95 per cent of the employees are promoted internally. Mr Suresh Pillay, the director of human resource and training development, adds: "Employees have grown with us - from a barista to assistant manager, to manager and then district manager. "This organisation is one that believes in developing individuals, not only at skills but also knowledge." Employees in supervisory and managerial levels are sponsored for relevant diploma and degree programmes to achieve career development and retention goals. 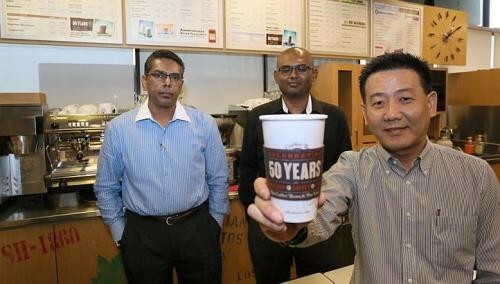 Mr Goo says that Spring Singapore's Business Excellence initiatives "were embraced and implemented in The Coffee Bean & Tea Leaf by chief operating officer Michelle Sassoon" in 2004. Take Mr Prabhakaran Govalin as an example of career development in the company. He started as a management trainee and, after holding other managerial positions, eventually became a district manager. Today, he is the operations manager. He is not the only one who has taken a different career path. Mr Goo says: "A barista who rose to become an assistant manager was always very interested in the equipment that came in. Now he is on a diploma course and is one of our best technicians." The chain has 53 outlets in Singapore and employs some 900 people. It has more than 900 company-owned and franchised stores across 15 states in America, and nearly 30 countries. The Sassoon family bought out the original American owners in 1998. The Coffee Bean & Tea Leaf also started focusing heavily on staff retention three years ago, especially when the tight labour market saw employees being poached. Staff incentives also include trips to The Coffee Bean & Tea Leaf home office in Los Angeles and tea plantations in Costa Rica and Sri Lanka. Mr Govalin, who has been to the US for tea classes, says: "I came into the company in 2003, and after it embarked on the People Developer, there have been a lot of (new) courses. Now I can talk about tea to anyone." Having enthusiastic staff who understand how the business works and who can move into various positions in the firm also helps in succession planning - something that was not a focus before the People Developer. Mr Goo says: "Previously, if a district manager resigned, I would be dead because there would be no one to take over." Employees are constantly engaged at monthly staff meetings at the Henderson Park headquarters. Senior management gives updates on the organisation's performance and developments. Mr Goo says with a laugh: "They normally happen on Tuesdays. Why? Because Monday is always a bad day to do things. "We talk about what happened last month, share the upcoming promotions... all the departments will contribute. From human resource, training, marketing, operations and even accounts." It is important to educate employees about the business, its performance and growth, he adds, and the firm is open to sharing such information with employees. Staff at these monthly meetings are also recognised for their achievements or efforts. "After a discussion, the staff member was given a cash reward and was surprised. Employees know people are looking, that when you wear the uniform, you carry the brand. At the end of the day, The Coffee Bean & Tea Leaf puts its people first. Mr Goo says: "We always ask them, what do you want, how can we help you grow, and how can I help you to stay?"